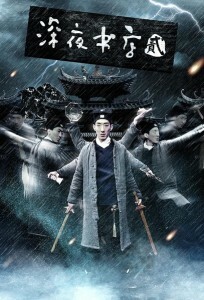 Directed by Du Jingfeng, “Midnight Bookstore II” is an anthology film, linked by the tale of Daoist monk Lu Shiyi (Peng Yusi) on a mission to recover a lost book of secret techniques. During his search Lu senses the auras of those possessed by bad spirits and offers his help along the way. 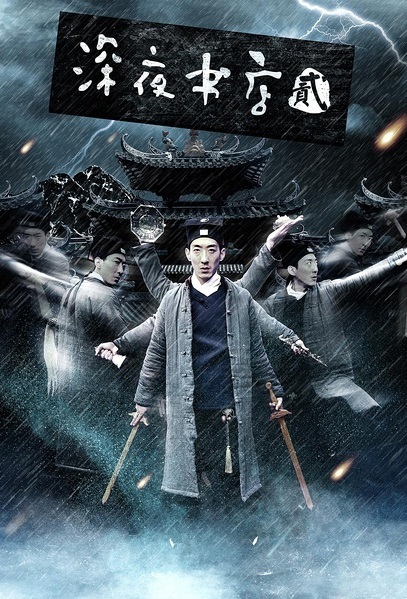 The possessed characters are all drawn to a 24-hour bookshop and the shopkeeper Wu Xiubo (Zhao Jiaqi), a demon slayer whom Lu finds in possession the lost book. During their battle for this book. Wu and Lu end up saving the lives of these people by either restraining the bad spirits with their powers or converting them to good with benevolence. The stories of these troubled souls are very much presented in the style of urban legends, each of the three chapters, depict a different haunting idea, shot in a mixture of styles that set them apart, some scenes are filmed with very modern tight hand-held, close-up camera work, others in rich technicolour or “aged” flickering screens. There are stylized vignettes that capture moments of creeping horror and fear as well as genre breaking humour, and nostalgia for the history of Chinese horror films. Whilst the stories do rely on centuries of stereotyping, such as wailing banshee-like women damned by unrequited love, one has to admit that the archetypal female spirit of the Chinese gothic, both in her ethereal form, and having traveled back to the screen by way of international success stories like Japan’s Grudge and Ring films…just looks so damn good. It would however be good to see some male ghosts every now and again, and maybe some women taking up the mantel of demon hunters! “Midnight Bookstore II” is a little gem of the low budget indie cinema which is thriving on the internet in China. It continues the excellent tradition of classic “Chinese vampire” horror movies, with simple but exciting practical effects, enthusiastic makeup and the very unique slapstick humour that Shaw and Golden Harvest brought to their super natural films through the 70s, 80s and 90s. The fact that the techniques have now been updated, and adopted by mainland film makers using new distribution methods, with a hint of social satire thrown in is a loving call back to films that were once dismissed as schlocky, or full-on corny. The closing credits even dedicate the film to Ching-Ying Lam, whose roles in those films helped make them so iconic. I had originally planned on just watching a few clips of “Midnight Bookstore II”, which was released this year, but found myself consuming the whole thing, and very much looking forward to finding the first film, which I think may well be even more enjoyable.